Summary: As our long war with Islamic nations spreads, its worth a moment to see beyond the fear and lies which clog the news media. Today we look at one of the many books which accurately describes our relations with the Islamic peoples. 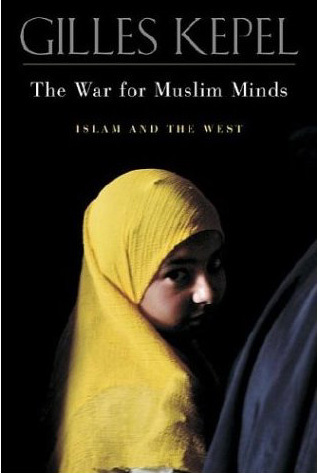 The War for Muslim Minds: Islam and the West by Gilles Kepel (2004). Reviewed by James E McGinley (Major, USMC, Retired). Originally published in the Marine Corps Gazette of April 2005. Republished here with their generous permission. What do neoconservatives and radical Islamists have in common? More than you might think, according to Gilles Kepel. His new book, The War for Muslim Minds: Islam and the West, is a concise survey of terrorism, its roots, and its battlegrounds. Throughout it Kepel performs a delicate balancing act, providing broad new perspectives attractive to the strategist and intimate details useful to the researcher. While few doubt that the watershed event of the new millennium was the terrorist attacks of 11 September 2001, it can be difficult to grasp the complicated nature and interlocking history of their underlying forces. Kepel examines these forces with insight and clarity. for militants, the revitalizalion of radical Islamism by recasting it in an international context. However, each had similar proximate goals: the ousting of the region’s regimes, whose authoritarianism and corruption they both abhorred. For radical Islamists 1996 was a hinge year. Facing the failure of local jihad movements in Bosnia, Algeria, and Egypt, its strategy required refocusing. In August of that year Osama bin Laden issued his “declaration of jihad against the Americans occupying the land of the two holy sites,” a reference to the continued U.S. presence in Saudi Arabia. This would mark the beginning of a slowly escalating strategy that would eventually lead to the events of 11 September. It was a strategy aimed at swaying the mass of Muslim opinion through symbolic victories. It is the Muslim masses that represent the final, and determining, battleground for radical Islamism. Kepel explores the undercurrents shaping Muslim attitudes in Saudi Arabia and in Europe. Saudi Arabia is characterized as being “in the eye of the storm.” Containing the Great Mosque of Mecca, Islam’s most holy site, Saudi Arabia finds itself the, perhaps sometimes reluctant, protector of the faith. Willing to encourage Wahhabism as a religious and moral counterweight to Iran’s portrayal of the Saud family as U.S. lackeys and willing to trade religious expression in exchange for political support for the monarchy, it now finds itself in possession of a movement with increasing appeal to its own growing, and increasingly restless, population. Economic accommodation with the United States in juxtaposition with moral accommodation to Wahhabism has placed Saudi Arabia in a political dilemma. Kepel’s freshest insights are perhaps expressed in his exploration of Muslim attitudes and activities in Europe. France, possessing the largest Muslim community in Europe and a longstanding victim of Muslim terrorism, has taken an uncompromising attitude toward combating terrorism. However, Europe finds itself also in a dilemma. Faced with multicultural populations, how can it best pursue policies of integration while preventing the proselytizing influence of radical Islamists? The benefits of political asylum and freedom of expression can challenge Europe’s liberal tradition if they are co-opted by radical Muslims to establish and maintain cultural separatism. According to Kepel, the battle for the Muslim mind in Europe is a battle over the right for self-determination, and the war for Muslim minds around the world may hinge on its outcome. Gilles Kepel’s book is contemporary, compelling, and a recommended complement to any military planner’s, political strategist’s, or historian’s library. Gilles Kepel is Professor and Chairman of Middle East Studies at the Institute of Political Studies in Paris. James E. McGinley (Major, USMC, retired) lives in Fredericksburg, VA.
Next Post Europe passes the last exit. A great crisis lies ahead. I am always fascinated that treatments of islam as a problem fairly consistently ignore the fact that much of the US’ problem with islam is predominantly a result of christian attitudes. I see what’s going on as nothing more than the-approximately-23rd crusade (give or take an iteration) – but modern western societies don’t want to admit that the conflict is between two religions; they prefer to cast it as oh-so-civilized society having a conflict with one religion. That’s nonsense. Especially when you read the wording on both sides of the conflict: it is predominantly sectarian. And when it’s not, it’s still sectarian. Add to the mix another religion (judaism) and this is nothing more than 1100ad redux with upgraded weapons and a thin veneer of not very successful pushback from the few atheists embedded in the various camps that are willing to point out that all 3 sides are a bunch of religion-addled fools. We have to confront the fact that a lot of US politicians believe that the “holy land” is in fact “god’s country” and that means confronting the fact that our leaders are exactly as crazy as the crazy islamists we complain about, and the crazy zionists who think that a supreme being granted them title to some real estate in exchange for a bunch of foreskins. We need to acknowledge that, yes, it’s a cultural conflict – but that the cultures that are clashing are cultures formed and placed in opposition by religion. When the muslims call the US troops “crusaders” they are not kidding – today’s western attitudes toward the middle east are probably pretty close to those held by Richard the III and the eastern attitudes are pretty close to those held by Saladin. Plus ca change, plus c’est la meme chose. My opinion is that it will remain impossible to have any kind of resolution to this conflict until mankind outgrows its absurd need to insist that their imaginary playmates care deeply about human affairs. Yeah I feel the same way. I have no connection to the Christian religion, I’m descended from Buddhists and communists, so to me it all seems like madness — except they’re playing with bombers and armies. Even a cynical imperialist goals would be less stupid and destructive, but this country can’t even pull that off. America is zoning out to re-runs of WWII on the war channel, and fights wars against imagined ‘New Hitlers’ while its soldiers are defending little plots of land in Afghanistan. It’s a wretched stew of WTC victimization, massive denial of US actions in the recent past, messianic Christian religious mania, all stewed in with worst case hubris. I don’t think this will go well unless Americans wise up fast, and I don’t see the media cooperating with this, though I am honestly somewhat encouraged by the anti-war comments I was seeing even on some mainstream news sites. It’s like the media is repeating their pro-war mantras, and the readers are screaming bloody hell in the comments — of course the media types are deaf to us, outside of reading poll numbers. One way is to wait another ~ 20 years, so then THEY will face with the dilemma: how can it best pursue policies of Islamization while preventing the proselytizing influence of radical, aging multiculturalists from across the ocean. While typing that message in my Word I found that spellchecker doesn’t recognize word “Islamization”, while recognizing “Christianization”. For a start , most Westerners are Atheist or Oldbiblical. The word Christian should be limited to the very few followers of the teachings of Christ . Those who turn the other cheek , give all their goods to the poor and do not kill . I agree that there are few followers of the teachings of Christ as reported in the Gospels. However, my guess is that most professed Christians are followers of Pauline doctrine — as has been the case since Paul hijacked the early Church. It’s a more practical doctrine, with deep roots in the well-developed first century theology of the Pharisees. On a broader and more speculative note, I suspect our distant descendents will not understand the violent squabbling among such closely related religions as Islam and Christianty. They might have diffciulty distinguishing them from each other, due to their relatively small differences (to them). This whole conflict seems thousands of years old, and empirically it is. It’s latest manifestation is relatively short lived. The relationship between Jerusalem and Washington DC is a the core of the conflict in the last 44 years. Since 1967 (Six Day War), the US has fed its Christian based hegemony by allying so closely with Israel, that elitist American Christians may put their head on the pillow each Sunday night thinking our nation has won the Crusade that the European Knights failed to secure a thousand years ago. Having Israel and the US team up to keep Jerusalem free is a recipe for steaming hatred of the US and the Jews by modern Islamic regimes, and the Arab Street. The alliance of US/UK/Israel to hold the Muslims in check at the gates of the Old City is a painful reminder of what was lost in 1967. We have stoked the fires in the Middle East to keep our SUVs running and our tech companies rich (INTEL, Cisco and now Apple have multi-billion dollar investments in Israel). It may be that the Arab Spring was not about bringing democracy to the Middle East, it was about flushing the old and paralyzed leadership down the Cold War drain. I fear that the Arab Street will take over these countries and bring locked down status to these societies and send the backwards to 1973 (Yom Kippur War) once again. Israel is the wildcard here. Some say that their sabre rattling is just that, other claim an Israeli first strike on Iran is “Archduking” circa 1914. What features does Israel have , that Intel, Cisco and Apple set up multi-billion dollar investments there rather than in the US ? Israel is the MOST entrepreneurial country on earth (look it up). There is a book – Start-up nation by Dan Senor which explains it all. It is a good read and shows the power of the Israeli economy. That computer you are using, the one with the Intel Core 2 Duo or iX chip? Designed in Israel as have all Intel chips since the mid nineties. What Israel has are the most tech friendly tax laws, the most MS in Comp Science per capita (check it out) and a free thinking, hard working flat society run by young military veterans. A recipe for business innovation and success. (1) The question was why to multinationals build in Israel. Entreprenurial strength probably has little to do with that. More relevant are the supply of trained people, low costs, low taxes, little regulation. (2) I believe the best recent measure of global entrepreneurship is this study sponsored by the Small Business Administration: “The Global Entrepreneurship Index Rank of Countries“, Zoltán J. Ács (George Mason U) and László Szerb (U of Pécs, Hungrey), April 2010 — Israel ranks #21. The top three are Denmark, Canada, and the US.